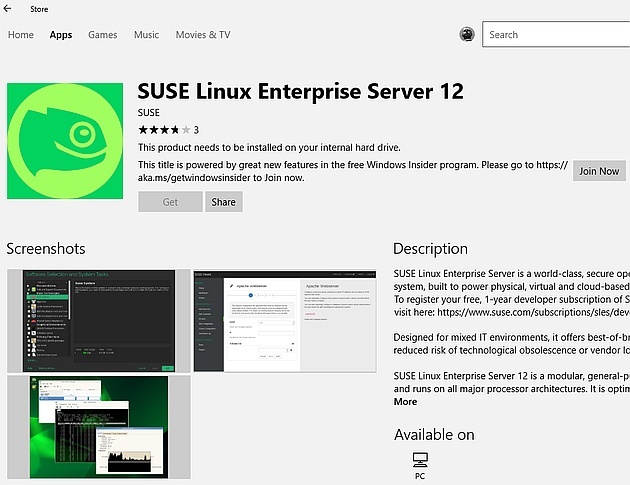 Members of the Windows Insiders program can now download SUSE Linux Enterprise Server and openSUSE directly via Microsoft's Windows Store. Windows 10 users who are not members of the program can view both programs in Windows Store, but cannot download them. What looked like an impossible event about a decade ago is now happening - Windows users can download Linux using Microsoft's app store. Obviously, for free. However, only members of the Windows Insider program can do this right now, but it will probably take a few weeks until everyone gains this privilege. Although not everyone can download SUSE Linux Enterprise Server and openSUSE via the Windows Store app yet, those who are not taking part in the Windows Insider program can see all the details of these two Linux operating systems straight inside the program's main window. Ubuntu and Fedora should hit the Windows Store too, but they are nowhere to be seen yet. The Windows 10 Creators Update arrived with a host of new features to WSL, as the Redmond giant worked with Canonical for a while to bring native Bash to Windows. While openSUSE 42.2 is a stable distro aimed at both beginners and experts that use desktop or server environments, SUSE Linux Enterprise Server targets "physical, virtual and cloud-based mission-critical workloads." We will probably get back to these two distros once everyone can get them via the Windows Store app, so stay tuned.